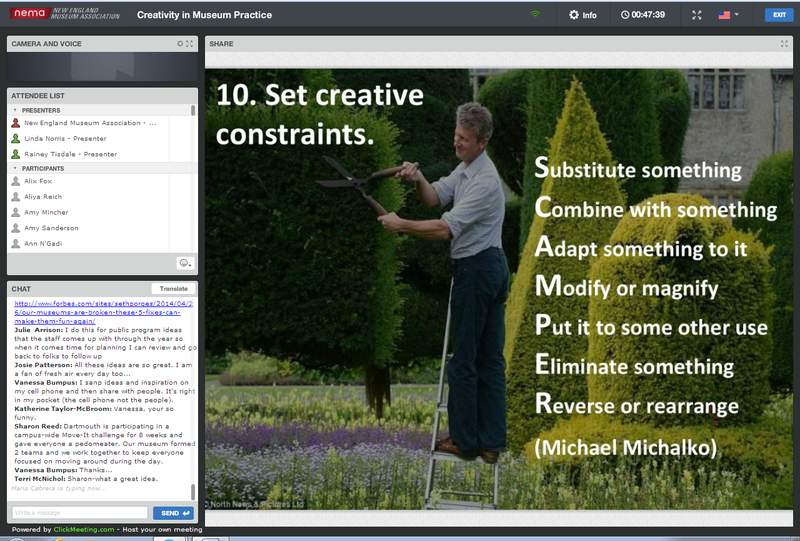 Last week I participated in a webinar run by NEMA on creativity in the workplace (specifically museums, but hey, most workplaces have at least something in common, generally, coworkers, meetings, and too much paperwork). Led by Rainey Tisdale and Linda Norris, authors of the new book Creativity in Museum Practice, it was an interesting discussion of ways to shake up the usual run of the workplace to encourage change and risk taking. 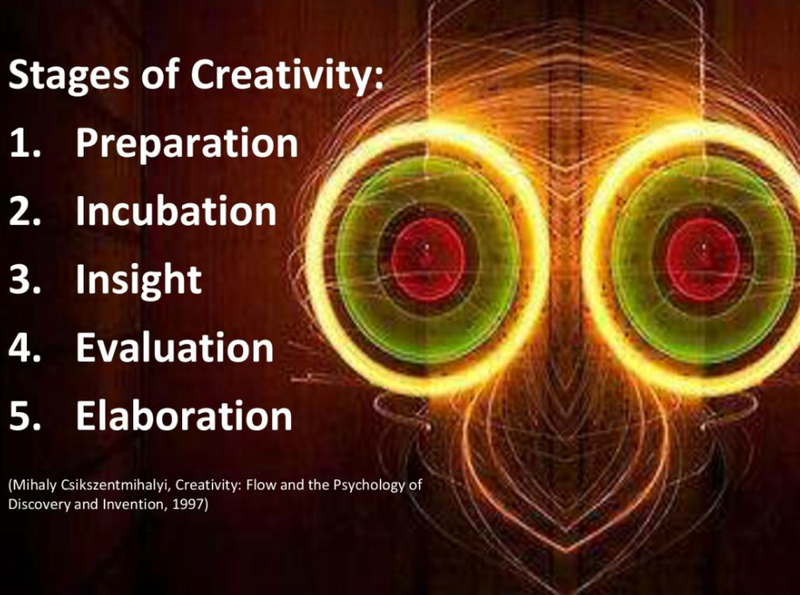 1) Reflect on your own creativity and habits using Twyla Tharp’s ‘creative inventory’ from The Creative Habit. This includes thinking about your earliest creative efforts, your ‘greatest’ and ‘worst’ ideas, your role models and your fears. In the week since the workshop, I’ve been considering how useful this method might be in analyzing things like: How do these shape the way you currently act, and where are you holding yourself back from trying something new? 2) Increase the amount and variety of your organization’s information diet. As a writer, I’ve come across the advice to read widely and often to improve one’s writing, and it strikes me as part and parcel of the same advice here. There were some great examples of how to bring in outside viewpoints, including some from the webinar audience. My favorites were watching TED talks at department lunches, sharing what people were reading outside of work, and hosting a ‘Curiosity Club’ to talk about other things we are interested in outside our professional expertise. 3) Make space in your daily routine for ‘incubating’ your ideas. Taking a walk during lunch is pretty much a requirement for me if the weather’s even slightly palatable, but I’ve been trying to make space in the mornings before work to work on my own creative projects, and I find my outlook on the day is better when I do, so I’m definitely behind this concept. 4) Reframe your projects as experiments, and embrace the possibility of failure. Talk it out-what is the worst that could happen? And if it’s too big a bad, make your experiment smaller. Prototype. This is the way I approach my cooking. Which is why I eat a lot of sandwiches, but I haven’t died of malnutrition yet, and sometimes I end up with really good stir fry. 6) Start an idea file, or files, personal and collaborative. I’m already a big fan of Pinterest, so that works for me! 7) Set creative constraints. “I don’t even know where to start!” is a pretty common block to a creative process, so give yourself a set of restraints, including but not limited to budgets, physical spaces, materials, or themes. Or try the Scamper method, which looks interesting and was new to me. What methods do you use to stay creative in your professional life? Contribute your ideas in the comments!